Lakewood Vineyards planted 10 experimental vines of Valvin Muscat in 1992. A cross of Muscat du Moulin and Muscat Ottonel, Valvin Muscat is more winter hardy and disease resistant than vinifera. Mature vines can be large and vigorous, and growers need to control the crop load. Valvin Muscat should be harvested on taste, between "herbal" and over-ripe, to get pure Muscat aromas. Many New York winemakers make Valvin Muscat in a frizzante-style. The CO2 balances the fruit and residual sugar. The Muscat family of grapes is believed to be among the world’s oldest cultivated varieties. Long known for making sweet and fruity wines, Muscat’s popularity has increased dramatically in recent years. According to data from Nielsen, Moscato sales were up a whopping 73% in 2011. In 2012, Muscat varieties as a whole were up 33% and edged out Sauvignon Blanc as the third most popular white wine in the United States. Even with growth slowing to a tamer 13% in 2013, Muscat sales are still on an upward trend. Muscat production in this country is dominated by California, but eastern wineries needn’t sit on the sidelines while Muscat’s popularity rages. Thanks to Cornell University’s Valvin Muscat cultivar, wineries in many regions of the United States can now enjoy a piece of the action, even those in locations where traditional Muscat varieties prove too difficult to grow. Developed in the 1960s at Cornell University’s New York State Agricultural Experiment Station, Valvin Muscat was known only as NY62.0122.01 until its naming in 2006. It is a complex interspecific hybrid resulting from a cross of Muscat du Moulin (Couderc 299-35) and Muscat Ottonel (see parentage at bottom of page). The cross produced a vine more winter hardy and disease resistant than its pure V. vinifera cousins while maintaining distinctive Muscat flavors and aromas. It is an exceptional stand-alone varietal and blending partner. Although Muscat is an ancient family of grapes, it wasn’t until the early 1990s that cuttings of Valvin Muscat were available to growers and research cooperators even on an experimental basis. Valvin Muscat has only been released for commercial propagation since 2006. This relatively short commercial history means no winery has logged generations of experience with it, and commercial plantings aren’t as widespread as more established varieties. As a result, Valvin Muscat producers are a fairly small club. To add depth to this temporally shallow pool, I have sought to aggregate information from numerous producers with a record of quality production. Some of the earliest commercial-scale plantings of Valvin Muscat were done at Swedish Hill Winery, located on Cayuga Lake in the Finger Lakes region of New York. Dave Peterson, Swedish Hill’s owner, has been working with Valvin to some extent since the early 1990s. He recalls the variety being a slow grower at first, prompting them to hold off cropping the vine until the fourth year. Peterson notes that on their site, despite being slow starters, mature vines are large and can be excessively vigorous, especially in light crop years with adequate rainfall. Over-cropping, he says, creates a biennial pattern with crops vacillating from 1 to 7 tons per acre. Once established, this pattern can be difficult to break. To control this, he recommends cluster thinning in some years. Swedish Hill has tried several different trellis systems, including high-wire cordon, VSP and umbrella, but currently Peterson uses just two long canes tied to the top wire, provided he can carry enough buds to balance the vine. The owners of Swedish Hill found the excessive number of non-count shoots rendered high cordon impractical, while the plants’ lackadaisical commitment to upright growth made VSP frustrating and less economical to maintain. Alternately, Jeff Morris, owner of Glenora Farms on Seneca Lake (Dundee, N.Y.), prefers VSP on his site. He thinks it’s the best way to keep the fruiting zone somewhat open and manage the high vigor. He also says he doesn’t worry too much about vines that flop out of the catch wires, as he’ll trim them when he summer prunes. Because of Valvin’s vinifera background and suspected susceptibility to root phylloxera, Cornell recommends the vine be grafted to another rootstock. Experiments by Cornell have shown better pruning weights and crop yields on grafted vines. All the Valvin Muscat at Glenora Farms are grafted to Couderc 3309, and Swedish Hill’s are on a mix of Kober 5BB, Teleki 5C and Couderc 3309. Peterson hasn’t seen any difference in performance between the various rootstocks. Bud break for Valvin Muscat usually falls between Concord and Cayuga White, while 50% bloom is usually three to seven days after Concord. Considered a “mid-season” variety, it reaches maturity on par or soon after Cayuga White, which is usually mid- to late-September in the Finger Lakes. Growers and winemakers alike praised the variety’s resistance to bunch rot and only moderate susceptibility to downy and powdery mildew. Dr. Bruce Reisch, Cornell’s grape breeder who developed Valvin Muscat, says it does exhibit rupestris leaf spot, but it is not a concern. Valvin is considered slightly less cold hardy than Cayuga White. Even so, at Lakewood Vineyards on Seneca Lake, nine of the 10 original experimental vines planted in 1992 have survived, despite an embarrassing lack of attention and temperatures of -6° F this past winter. While trunk damage is not uncommon, Valvin produces an abundance of suckers for renewals. Another vineyard issue is predation. One of the first things we noticed at Lakewood Vineyards was that the grapes were very attractive to the birds. Speaking non-scientifically, this is usually a good sign of grape quality, as most grapegrowers will attest that birds generally prefer to peck away at the high-end stuff. Even so, most growers I spoke with didn’t take any extraordinary measures such as netting to fend off birds. One grower, with a chuckle, suggested planting extra so you could have some left over when the birds were done eating. Most winemakers agree that harvest times should be based on taste rather than strictly Brix and TA levels. Unlike some grape varieties, Valvin’s flavors are comparatively easy to access in the vineyard because they translate so directly into the finished wine. Early harvesting favors citrus and herbal tones, while later harvest sees a precipitous drop in acid with less pure Muscat flavors. Bernard Cannac, winemaker at Heron Hill on Keuka Lake (Hammondsport, N.Y.) referred to “foxy” notes if the variety was over-ripe. Somewhere between herbal and “foxy” is where you find the nicest orange blossom, peachy-melon aromas and flavors—or what Peterson described as “pure Muscat” aromas. Valvin Muscat is not a particularly high-sugar variety. Harvest Brix generally range from as low as 15.5° to as high as 19.5° F. While winemakers are generally loathe to discuss it, most Valvin wines receive some level of chaptalization or back sweetening. As the author, I feel the responsibility to confess to my winemaking readership that I sometimes resort to such tactics to achieve the end results I am looking for. This vein of honesty is probably why I don’t write a column about marketing. My point is, if you make your harvest decision based on some arbitrary Brix goal, you may find your fruit out of specs on other things much harder to remedy than low sugar. I have harvested Valvin below 16° Brix based on flavor and TA, and even in retrospect I am certain it was the best decision. The flavors were fully developed, and the wine was balanced and delicious and went on to make the marketing department very happy. Other winemakers I spoke with specifically mentioned that they have never harvested higher than 17° Brix. The general feeling is later harvesting negatively impacts wine freshness. Some winemakers I polled utilized skin contact, but most did not. Cornell Extension associate Chris Gerling believes some skin contact prior to fermentation can help boost the aromatic intensity. He stressed that cold temperatures during skin contact are important, adding that their experiments with extended cold soak (up to a week) were not beneficial. More experiments with skin contact and maturity levels are in the works. Winemakers’ choice of yeast varied, but all were among the typical aromatic white selections: Some favorites were Epernay II or Red Star’s Cote de Blanc and QA23. All winemakers I talked to employed a cool fermentation in stainless steel tanks. Whether fermentation was arrested or carried to dryness and back-sweetened, all Valvin wines I’ve encountered so far were finished with some residual sugar, with a majority of producers settling in at 20 g/L or higher. At Villa Bellangelo (Dundee, N.Y.) on Seneca Lake, Valvin Muscat is used to produce two styles of wine as well as a blending component in a third. Owner Chris Missick has always favored a frizzante style with their Valvin, leaving enough CO2 to balance the fruit and residual sugar, which runs around 50g/L. Capping the tank toward the end of a cool fermentation preserves enough naturally evolving CO2 to achieve the desired effect. In fact, managing dissolved CO2 at some perceptible level was a tool used by most Valvin producers. Swedish Hill leaves a little effervescence in their offering, as does Heron Hill. At Lakewood Vineyards, we arrest fermentation with refrigeration and intentionally maintain cold temperatures all the way through bottling to hold some carbonation. Only one producer I spoke with, Hunt Country Vineyards (Branchport, N.Y.) on Keuka Lake, bottled their Muscat completely still. Hunt Country assistant winemaker Brian Berry explains that they’ve made the choice to keep it still because they feel the wine has enough going on that it really doesn’t need any lift from CO2. Missick describes Villa Bellangelo’s other style of Muscat as similar to “a French-style Muscat, like the wines of St. Jean de Minervois and Rivesaltes.” Named Muscat Vin Doux Natural, this wine is a lightly fortified dessert style for which they halt fermentation with the addition of distilled spirits. Finished alcohol is 15.5%. In my experience, wines produced from Valvin Muscat have always required some level of bentonite fining to achieve heat stability. The 2013 vintage was the worst case yet for us, requiring 7 pounds of bentonite per 1,000 gallons. Most years call for at least 2-3 pounds per 1,000 gallons. Other winemakers reported similar experiences. Juice fining might be a good option for this variety. YAN numbers for Valvin can vary widely and bear some investigation. Gerling reported numbers as low as 47 ppm and as high as 194 ppm for Finger Lakes Valvin in the 2010-12 vintages. His feeling was that, lacking any specific information on a particular lot, an addition in the range of 50-100 ppm nitrogen would probably be safe. 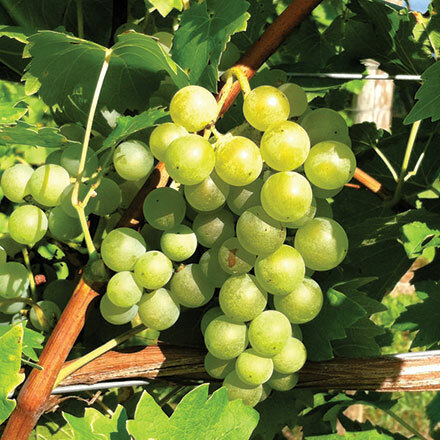 In the Finger Lakes, some growers who are successfully growing high-end vinifera cultivars are nonetheless allotting a portion of their prime sites to Valvin Muscat. This in itself speaks highly of this variety. With the fruit bringing growers around $1,000 per ton, and most Valvin Muscat wine prices in the mid- to lower-teens, it’s a win-win for growers and winemakers alike. Chris Stamp is president and winemaker at Lakewood Vineyards in Watkins Glen, N.Y. He started his wine career as winemaker at Cayuga Vineyards in the Finger Lakes and in 1986 took a position as enology research and extension associate at the Ohio Agricultural Research Development Center in Wooster, Ohio. When his family opened Lakewood Vineyards winery in 1988, he returned to New York to become the winemaker there.